We Buy Houses All Across the United States and Can Buy Your House in One Hour or Less! 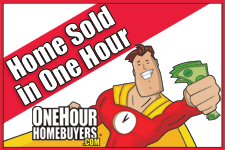 Yes, you can sell your house in one hour or less by selling your home to a One Hour Homebuyer! OneHourHomebuyers.com is a group of independently owned and operated real estate investment companies located throughout the United States that buys houses fast from people like you in neighborhoods just like yours. We buy houses in any condition or price range all over the USA. We buy pretty houses, not-so-pretty houses, pretty ugly houses, townhomes, condominiums, single family homes, multi-family homes and apartments too. If you have a house you need to sell fast, we can buy your house fast, often in one hour or less which means you can sell your house in one hour or less! Our One Hour Rapid Home Purchase Program makes selling your house faster, easier and more convenient than ever before! To see if your house qualifies for our "One Hour Rapid Home Purchase Program", please complete our Confidential Seller Questionnaire to the right of this page. Tell us all about your house for sale and one of our local, professional home buyers will contact you ASAP about buying your home fast... one hour fast! If your home qualifies for our Rapid Home Purchase Program, we'll schedule an appointment to come out and inspect your property and make you one or more offers to purchase your home on the spot, in an hour or less, guaranteed! We specialize in finding creative solutions to real estate problems that real estate agents and other home buyers won't touch. We can pay you all cash, take over your monthly mortgage payments or lease-purchase your house immediately! We will handle all of the paperwork, make all the purchase arrangements and close within a few days if necessary. You'll get a quick home sale with no hassles, so you can put your home selling worries behind you once and for all. Why wait another day to sell your home when you can sell your house in one hour or less? There is no more waiting... sell your house to us today! We Buy Houses Fast in Any Area, Condition or Price Range and Want to Buy Your House!